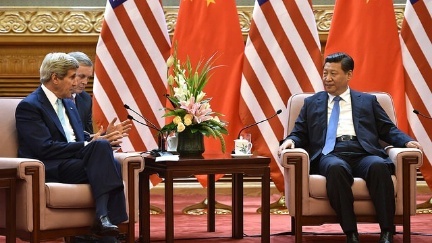 Secretary Kerry meets with Chinese President Xi Jinping on July 10. The recent U.S.-China high level Annual Strategic and Economic Dialogue meetings in Beijing again underlined the many difficulties that the U.S. and others are having in achieving together the goal that China once said it wanted, namely the peaceful rise of its country on the global stage of international responsibility. Clearly, there is something amiss in China’s sometimes aggressive statements, and indeed militaristic actions and behavior. The question is what is behind these actions and contradictory statements? There are conservative and nationalistic ideological schools both in China and the United States that seem to believe that an ultimate clash of nations will take place between these two great powers. Both of these are dangerous perspectives since they seem, for un-imaginable reasons, to want that war, rather than attempting to find ways to avoid such a calamity. As Kerry put it well at the end of the meetings, that while they had the capacity to manage their differences they should “avoid falling into the trap of a zero-sum competition.” Justly said! The meeting was split between areas of cooperation like North Korea, terrorism, Iran, and even climate change, and wildlife trafficking. Some progress was reported on economic, investment, and financial services access but no details were revealed. Disagreements continued about national claims to East and South China Seas where there are serious dangers of major conflict and Kerry tried to argue for a peaceful resolution. Issues on “cybertheft” and spying activities were unresolved, but frankly they should not get in the way of the larger purpose behind the strategic dialogue and long term macro interests. One problem is that the Chinese government is sending out mixed (or, in a less generous interpretation, misleading) signals as to their real intent and policy. They seem to be playing for one audience at home and another abroad. Or, pandering to the two sides of their “constituency,” on the one hand of business and more rational and thoughtful citizens, while on the other, also kowtowing to their more militant and nationalistic types. I suspect that this is not unlike elements in our own dysfunctional conflicted government. In China we see battling between the militant right wing crazies and the more pragmatic and realistic elements that see that seeking peace and prosperity for their people is the better road. And this is similar to the game in America, where the right is using pro-war nationalistic stances to gain political power, while in China, key nationalistic elements are hoping also to either keep their power or gain it. While the rational types realize that peace and trade is better for China than war, however there seems to be a dangerous trajectory based on using nationalism to maintain public support and steering attention away from the regime’s continued authoritarian bent and rampant corruption. Here in America it is simply the far right not caring a fig for the cost to long-term American interests and security if it can gin up their diehard political base. In the larger strategic sense, like with Russia, America needs to keep its eye on the long-term and macro-strategic questions. President Obama to his credit has not relented in his initiative of continuing our intense dialogue with China even in the environment of bad behavior by China. This is correct and in keeping with our best efforts during the Cold War followed by both of our parties that brought an end to that confrontation. Again, this is a long game and there will be lots of setbacks and also some progress and American policy must aim to strengthen the elements that promote common interests and cooperation and lessen and resolve elements that might lead to increased conflict and instability. We welcome your comments on the blog to continue a dialogue on our key issues of the day! Please do join.